Designed by Joshua Humphreys, the frigate USS Constitution was launched at Edmond Hartt Shipyard in Boston on October 21, 1797. Completed at a cost of $302,718, it carried a crew of 450 to 500 men, measured 204 feet in length with a beam of 43.5 feet and displaced 2,200 tons of water. The USS Constitution was one of six ships ordered by President George Washington to protect America's growing maritime interests. Humphreys incorporated the best features of existing English and French naval vessels and then designed ships powerful enough to defeat any enemy of equal size, yet faster than any stronger opponent. Although renowned for its ability to punish French privateers in the Caribbean and Barbary pirates in the Mediterranean, the USS Constitution's greatest accomplishment came during the War of 1812 when it defeated four British frigates. 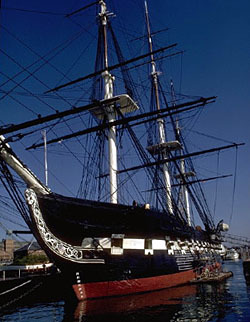 The USS Constitution earned the nickname "Old Ironsides" after battling the British ship Guerriere on August 19, 1812. British cannonballs seemed to bounce off its thick wooden sides, which were comprised of three layers of oak, and fall into the water. The USS Constitution returned to Boston in 1815 and remained there for six years before serving again in the Mediterranean from 1821 to 1828. A board of naval commissioners deemed the vessel unseaworthy and recommended the ship for scrapping in 1829. However, Oliver Wendell Holmes' popular poem entitled, "Old Ironsides," caused a wave of public protest that subsequently saved the ship and led to its restoration. 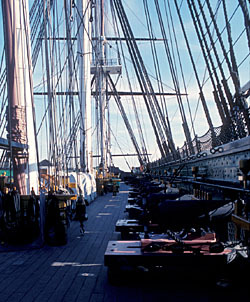 The USS Constitution performed many military tasks throughout the remainder of the 19th century, including service as both a barracks and training ship. Restored again in 1927, the USS Constitution toured coastal waters before being moored at the Boston Naval Shipyard in 1934. The USS Constitution is the oldest commissioned warship afloat in the world and gained National Historic Landmark status in 1960. It is manned today by an active duty U.S. Navy crew of 55 men and women. The USS Constitution, a National Historic Landmark, is berthed in Boston Naval Shipyard (Boston National Historical Park), on the south side of Chelsea St. in the Charlestown area of Boston. It is operated and maintained by the U.S. Navy in cooperation with the National Park Service. The USS Constitution is open from April 1 to October 31, Tuesday-Sunday from 10:00am to 6:00pm, and from November 1 to March 3, Thursday-Sunday from 10:00am to 3:50pm. The USS Constitution Museum is also located in Boston National Historical Park in Building 22, adjacent to the ship. The museum is open from 9:00am to 6:00pm in the summer and from 10:00am to 5:00pm in the winter. For further information on tour schedules or to make group reservations, call 617-242-5671 or visit the ship's website.